Visualise, explore and compare EU and country data on working conditions, quality of work and work-life balance in our interactive data visualisation tool. Overall, the EQLS 2016 results show general progress in the three key areas of review: quality of life, quality of society and quality of public services – though not in all countries and not for all social groups. There has been general progress in quality of life with some dimensions back to pre-crisis levels. For example, levels of optimism are up since the previous survey, satisfaction with living standards has increased, and life satisfaction and happiness levels remain stable. Satisfaction with standard of living has converged across Member States, self-reported quality of health has improved overall, and material hardship has declined (more people can make ends meet). But work-life balance has deteriorated and there are serious concerns about insufficient income in old age in two-thirds of countries. The findings reveal a general improvement in quality of society indicators since 2011. Trust in national institutions has increased, engagement and participation in social organisations are on the rise, trust in people among those aged 18–24 has increased, feelings of social exclusion have declined, and perceived tensions between poor/rich, management/workers, old/young, men/women have decreased. Yet, perception of tensions between religious and ethnic groups has risen slightly and, to a lesser extent, on the basis of sexual orientation. The data also show an overall improvement in ratings of quality of public services since the last survey round. Levels of satisfaction with several key public services, such as healthcare and public transport, have increased. Childcare has improved in several countries where ratings were previously low. Access to recycling facilities is a new issue in a number of countries, while access to banking in rural areas is a problem in some countries. However, quality of public services still varies greatly across Member States. Carried out every four to five years, this unique, pan-European survey examines both the objective circumstances of citizens' lives as well as how they feel about those circumstances and their lives in general, with an aim to create a rich data source on the quality of life of the people in Europe. The survey presents data on issues that general statistics do not cover, such as the perceived quality of society, trust in institutions and social tensions. It looks at a range of issues, such as housing, deprivation, family, health and well-being. It also looks at subjective topics, such as people’s levels of happiness, how satisfied they are with their lives and their participation in society. New EQLS 2016: Covered 33 countries, EU28 and 5 candidate countries of Albania, the former Yugoslav Republic of Macedonia, Montenegro, Serbia and Turkey. The EQLS is a survey of the adult population (18+) living in private households, based on a statistical sample and covering a cross-section of society. Depending on country size and national arrangements, the 2016 sample ranged from 1,000 to 2,000 people per country. Eurofound’s survey partners, Kantar Public, carried out face-to-face interviews in people’s homes using computer-assisted personal interviewing (CAPI) and covered a comprehensive list of questions regarding their quality of life. (All the information gathered has been treated in the strictest confidence and the anonymity of each interviewee guaranteed). The EQLS 2016 questionnaire placed a considerable focus on public services: healthcare, long-term care, childcare and schools, and measuring different aspects of quality such as fair access, facilities, staff and information available to citizens. Details of the survey methodology are available online. March 2018: The fourth EQLS microdata were made available. 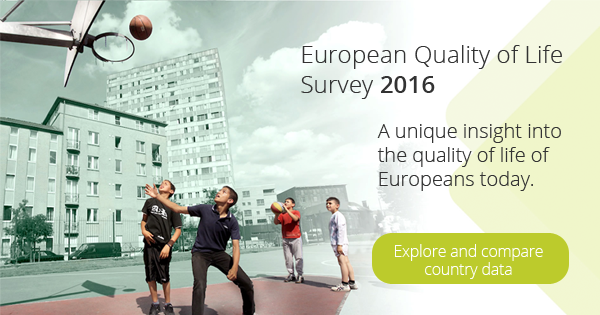 For further information about the European Quality of Life Surveys, contact Tadas Leončikas.